This weekend we avoided the gloomy weather and made more under cover sowings. Down the centre of our polytunnel is a four foot wide bed, which we use for general planting of crops including beans, peas, sweetcorn, saladings, and so on. At this time of year, it is warm enough, especially under cover, to make some early sowings of root crops, provided suitable varieties are selected. The bed was prepared by a little weeding and a light forking, followed by the application of a couple of handfuls of fish, blood and bone, which was lightly raked in. No manure was added, as root crops respond to too rich a rich soil by forking. Four foot drills were made across the bed. These were watered thoroughly before sowing. This bed had not been watered for some time, and it is amazing how much water is required to properly penetrate the soil. We sowed a couple of rows of the early carrot Amsterdam Forcing and a couple of rows of beetroot Boltardy, which is known for its resistance to bolting and therefore suitable for an early sowing. We also sowed a half row of turnip Purple Top Milan, which is quite quick to mature and best eaten when small, and a half row of radish Scarlet Globe. After three or four weeks, a second similar sowing will be made to follow on from these crops. We then attended to the first sowing of peas and broad beans to be planted out to follow on from the overwintered polytunnel crop. At this time of year, I do not sow peas direct, as they suffer in the cold wet soil and are often decimated by small furry pests. Instead, I sow a double row in lengths of old round guttering. When sturdy young seedlings have developed, a wide drill can be dragged out of one of the outdoor beds and the young plants slid out of the guttering into their final position. This is a convenient way to start them off under some protection. We sowed our favourite pea, Hurst Greenshaft, which has always produced a great crop of well flavoured peas that stand well before turning starchy. 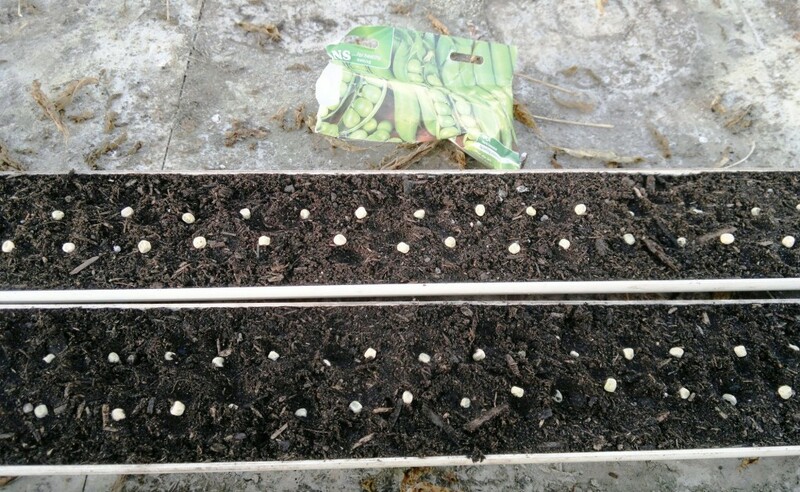 For the broad beans, we also sow under cover, this time in small pots with one bean per pot. Usually, not all will germinate, so a few extra pots are sown each time. These will be planted out in single rows of six or seven plants across a four foot bed. This year we have returned to our old favourite, Masterpiece Green Longpod. This grows somewhat taller than many, and bears a good crop of well flavoured beans, and is much my preferred variety so far. We then started some lettuce and brassicas in modules. I sow several seeds per cell, and thin to the strongest seedling. We sowed three different sorts of hearting lettuce, which will probably find a place in the polytunnel when ready for planting out, along with the first of the summer cabbages, Golden Acre and Copenhagen Market, which will be planted outdoors. We have grown both of these before, and they seem to perform equally well for us. One would not really need to grow both sorts in one season, as they serve the same purpose, but we have seed for both. When this expires, I will probably grow only one of these in a season, so will pay a little more attention to how each performs this year. I also sowed Rudolph, a very early variety of purple sprouting broccoli. Although normally grown as a winter or early spring crop, this is such a fast maturing variety that, for several years, we have produced a crop in the autumn from this early sowing and have to make later sowings for winter and spring use. Finally, we sowed our tomatoes, one of our very favourite crops. I usually sow these a few weeks after the chillies, peppers and aubergines, as they germinate and develop rather more quickly. In total, we plan to plant 48 tomatoes of fifteen different varieties. 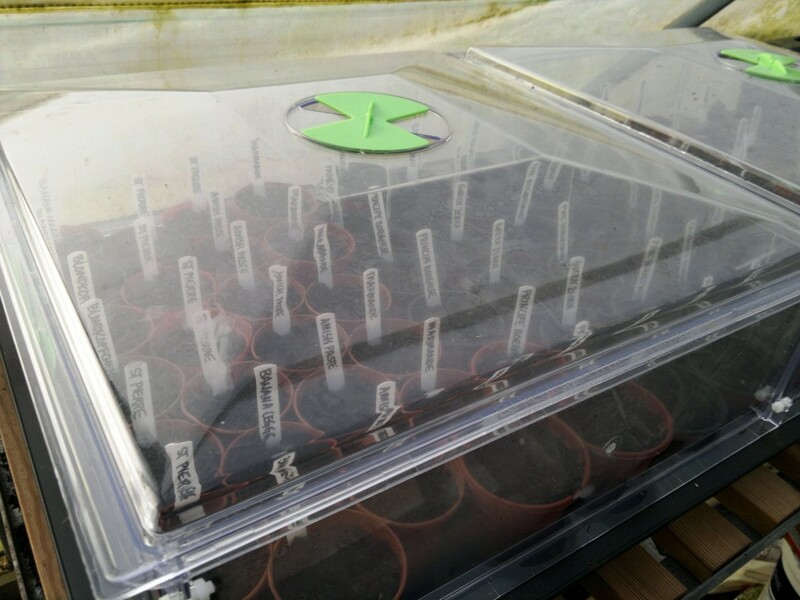 Following last year’s taste test, we have sown once again Gardener’s Delight, Black Cherry, Banana Leggs, Saint Pierre, Principe Borghese, Green Zebra, Marmande, Costoluto Fiorentino, Pera d’Abruzzo, and our only F1 hybrid, Sungold. New to us this year are Amish Paste, Pink Brandywine, Cuore de Toro, and a possible replacement for Sungold, Blondkopfchen. We are also growing Black Russian again this year, which we first tried a few years ago. Also a first for us this year, we have added some cape gooseberry and green tomatillo, both members of the Physalis genus, and readily identified by the papery calyx that encloses each fruit. These are members of the nightshade family, Solanaceae, so also related to tomatoes, peppers, chillies, aubergines, and potatoes. We will find them a place in one of the glasshouses.